OA#106. Where Duden's Rambler now located, Furgison's [Ferguson's] Furniture, n.w. cor. 1st & A. Framed CN Haines, Oswego's first marshall, 1910. Property of Lake Oswego, Friends of Library. Truchot 636-3585, enlarge framed big. Back row, left to right: Tracy Johnson, Frank Anderson, Wm. Meyer,?, (Ike Austin behind),(___,___ others), Chas. Haines, Henry Koenig, Pete Haines, Herman Maier, Herman Blanken, Louis Evans. Front row: Jack Conway, Alfred Johnson, Cleve White, Harold Conway, Leonard Davis?, Roy Fox, Clarence Skeel, Si Todd?. 2 dogs Sport & Hienie. [label]: NW corner 1st and A Sts., ca. 1910. Description Mounted on cardboard; tack holes and appears to be a copy of an original with stains. Same as 1537b, cropped differently. 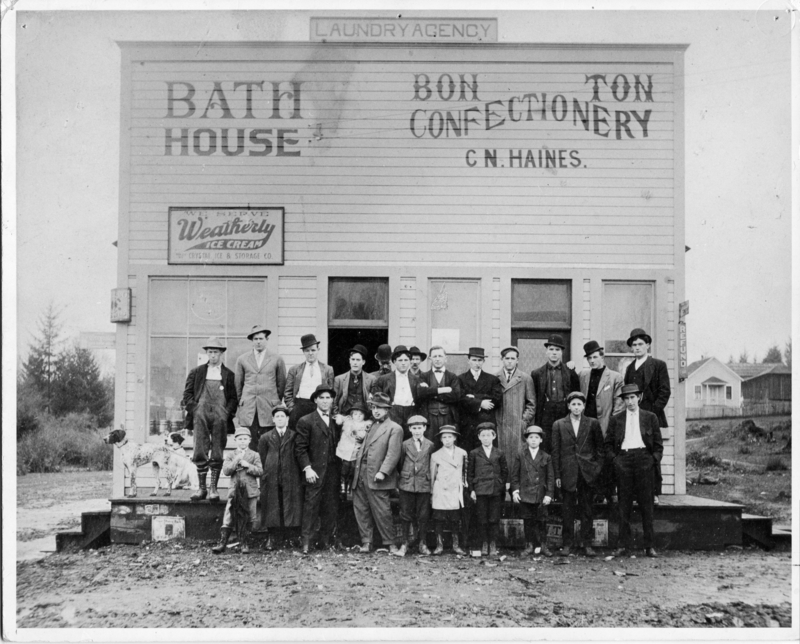 Signs on building: Laundry agency, Bath house, Bon Ton Confectionery, C.N. Haines, We serve Weatherly ice cream; Crystal Ice & Storage Co., Oregonian, refund. Caption from Iron, Wood, & Water: ""...Charles N. Haines, the man in the center without a hat, stood in front of his business on the corner of First & A...""
Transcription OA#106. Where Duden's Rambler now located, Furgison's [Ferguson's] Furniture, n.w. cor. 1st & A. Framed CN Haines, Oswego's first marshall, 1910. Property of Lake Oswego, Friends of Library. Truchot 636-3585, enlarge framed big. Back row, left to right: Tracy Johnson, Frank Anderson, Wm. Meyer,?, (Ike Austin behind),(___,___ others), Chas. Haines, Henry Koenig, Pete Haines, Herman Maier, Herman Blanken, Louis Evans. Front row: Jack Conway, Alfred Johnson, Cleve White, Harold Conway, Leonard Davis?, Roy Fox, Clarence Skeel, Si Todd?. 2 dogs Sport & Hienie. [label]: NW corner 1st and A Sts., ca. 1910.